Have yourself a Perry little Christmas! 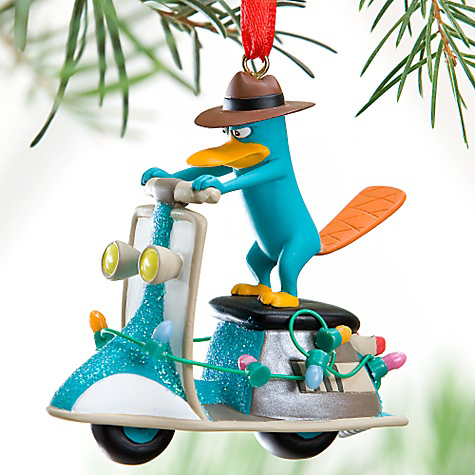 We featured some Perry the Platypus (from the show â€œPhineas and Ferb”) recently and here he is again in this very adorable Chrtistmas ornament. This is well priced at just $9.50 and measures 3″ high and 2 3/4″. It is made out of resin. Okay – POP QUIZ! – which real-life scooter do you think Perry’s cartoon scooter most resembles? This entry was posted in Holiday, Models, Figurines and tagged agent p, christmas, figurine, odd scoot, ornament, perry the platypus, phineas and ferb, scooter by Tracy. Bookmark the permalink. I was thinking Heinkel too. Heinkel in the front, Cushman in the back. I agree it is a Heinkel Tourist, but that aside where do I buy one of these decorations, I had a scout about the Disney store online & couldn’t locate it. It’s probably because I am intellectually challenged. Any help offered gratefully accepted. If there’s an online source for something I post about, it’s always at the bottom of the post. In this case it’s “Disneystore.com” in blue. Click on that and that will take you to the exact item so you don’t have to hunt and peck. Alas, when you click on that link now . . .
. . . it shows that Perry and his scooter are sold out. You might have to check a local Disney store to see if they have any in stock. Or set up an alert on eBay. Good luck!